The Congo Green Mantis is a larger species of mantis reaching up to 3.5 inches [9cm] in length, they are native to the Congo region of Africa as their name suggests. 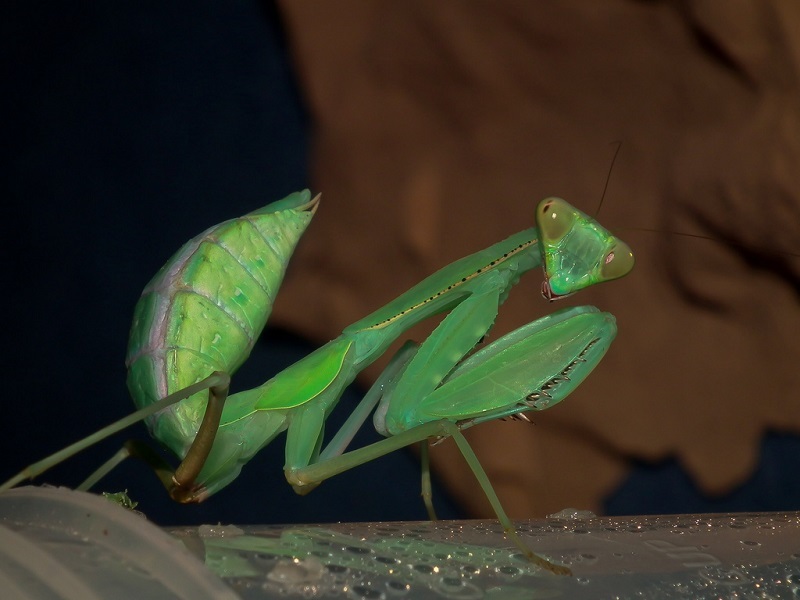 The Congo Green Mantis is very much a “typical” praying mantis – when you ask somebody to picture a praying mantis in their mind they will most likely picture something similar in appearance to Sphodromantis spp. – a large green mantis with a fairly typical mantis body plan. Sphodromantis in fact come in a variety of colours, ranging from deep browns through to creams, and then a whole bunch of shades of green. Their forearms, which are used to capture prey, often display some bright colouration which can be flashed by the mantids as a warning when they feel under threat. Most mantids are from tropical countries although a few do occur in cooler climates. Their closest relatives are the stick insects, grasshoppers and cockroaches. Like their relatives the mantids undergo simple or incomplete metamorphosis; they do not have a maggot or caterpillar but go through several stages all of which look like miniature, wingless adults. Click HERE for a Congo Green Mantis care sheet.